The Government of Canada conducts another massive Express Entry draw of 2019 on Wednesday, January 23, maintaining the number of invitations as observed in the previous draws. 3900 candidates were invited to apply for Canadian permanent residence with ranking scores as low as 443. Since the start of 2019, Canada has now issued 7,800 invitations to candidates in the federal Express Entry system. 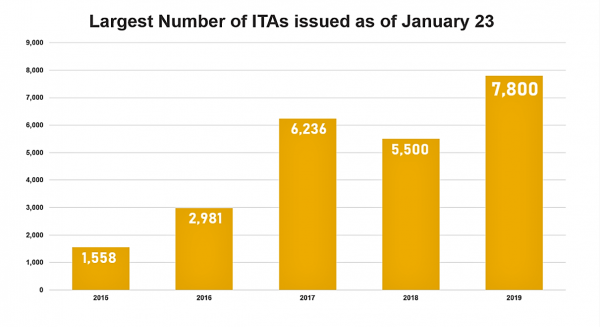 This makes a record of the most Invitations to Apply (ITAs) to be issued in the start of a year. The minimum Comprehensive Ranking System (CRS) score in this latest draw was six points lower than the minimum score in the first draw of 2019, which took place on January 10. Today’s score of 443 was the lowest score yet for a January draw through the Express Entry system. This decrease can be explained by the fact only two weeks elapsed between these two invitation rounds, while a gap of three weeks separated the January 10 draw and the previous invitation round on December 19. Less time between draws means fewer candidates have time to enter the Express Entry pool, which can have the effect of lowering the minimum CRS score. The tie-break rule in the January 23 draw was January 2, 2019, at 03:55:26 UTC. 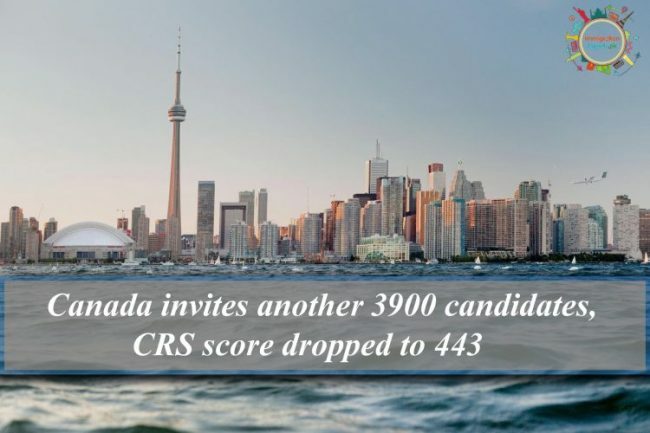 This means that all candidates with a CRS score above 443, as well as those candidates with scores of 443 who entered their profile in the Express Entry pool before the selected date and time, received an ITA in this invitation round. This was the highest number of invitations issued in a first month of the year in the five-year history of Express Entry system. How the Express Entry works? Three Federal High Skilled economic immigration programs are managed by the Express Entry candidates — the Federal Skilled Worker Class, Federal Skilled Trades Class and Canadian Experience Class. Candidate profiles are assigned a score based on the Comprehensive Ranking System (CRS). This system awards points on factors including age, education, work experience and proficiency in English or French. The highest-ranked candidates are then selected from the pool through regular rounds of invitations, and are issued an invitation to apply for Canadian permanent residence. According to the Canada’s new multi-year immigration levels plan, Canada has an admissions target of 81,400 through these programs for 2019, compared to 74,900 last year. This means that the federal government has to welcome more Federal High Skilled candidates as permanent residents in 2019 than it did last year. In order to meet its projected 2019 and 2020 targets, it is expected that IRCC will have to issue more ITAs over the course of this year than it did in 2018. As in the last year IRCC gradually increased the draw sizes from 2,750 ITAs to 3,900.